Gambling will only get you so far. It is nice to win but a lot of the time luck has nothing to do with it. You win by working at it, doing the homework and not because the cards fell in your favour. Monaco is a city built on a casino, on the foundation that luck can bring you everything you need. But on Sunday in Monte Carlo luck had nothing to with it. McLaren won the event because the team has worked for it. The fact that Fernando Alonso took victory in the event meant that Lewis Hamilton was second. He seemed happy with that. When you are in your fifth Grand Prix and have finished on the podium in all five, you are still excited to be there but there was something about the smiles and the body language involved that hinted that Lewis would have been happier to have won. Everyone likes to win but there are times when luck has nothing to do with it. There will, no doubt, be questions as to whether McLaren had played with strategies of the two drivers to ensure that Alonso, rather than Hamilton, went home with maximum points. There was certainly enough evidence to suggest that one did not have to be Hercule Poirot to work out not only what might have happened but also why. Let's face it, if you are trying to win the World Championship do you send in a plucky novice or do you rely on a seasoned veteran with a World Championship (and bar) on his list of campaign medals. It is entirely logical to make sure that Alonso is the man who leads the way. Hamilton will get plenty of chances but he still has plenty to learn. He has mistakes that he is going to make. Modern sport is all about efficiency. If Hamilton was deprived of his first Grand Prix for the greater good of the team, it was done in a subtle fashion. And you don't have to be hugely clever to understand that the story of Hamilton is still in its opening chapters. There is time for many successes. From the start it seemed as though Fernando had this one well under control. He led from the start and pulled away. For the TV viewers the race may not have seemed that exciting but the fascination was there, sure enough: who had the bigger fuel load? Who was going to go the furthest at the pit stops? Who would be ahead on the road after the final pit stops were over? Hamilton may not have been leading but it was clear from quite early on that he was carrying a lot more fuel than Alonso. That made his performance in qualifying more and more impressive. That meant that Lewis was perhaps the fastest driver when all elements were equal. And so we waited for the story to unfold. It was all sweet music for a McLaren fan. The opposition was annihilated. Humiliated. By the end of the day the two McLarens were more than a minute ahead of mighty Ferrari. Everyone else was a lap behind. And yet then came a discordant note, a strategic move that seemed wrong. It did not fit. Hamilton came in before he should have done. "I was fuelled to go five or six laps longer than Fernando," Hamilton explained after the race. "They stopped me after only three laps, so I lost the time I might have had in which to really open up a gap. That's unfortunate, but that's the way it goes. I am looking forward to speaking to my engineers about it because I thought we were going to run shorter in the second stint and we didn't. "I just did my race and the team took care of it all," Lewis said. Lewis's charge after the second pit stop showed just how much time might have been gained if the strategy had been played out differently. 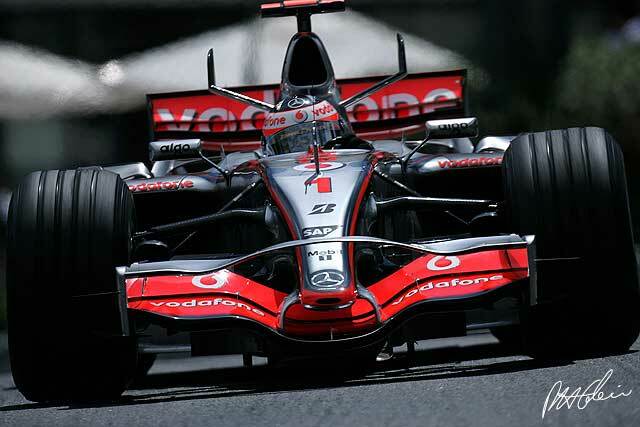 But would McLaren have gained anything from a Lewis Hamilton victory? There would have been more headlines, more coverage, more stress created because more pressmen would want to talk to him. There would have more chance of trouble, too, as a Hamilton win would have put Alonso on the back foot, would have put him under pressure which he does not need. No sir, it was wiser to leave Monte Carlo with 18 points in the kitty and Alonso back in front in the World Championship. The two men are now equal on points but there is no such thing as equality in F1. Alonso has won a race Hamilton has not. That puts Alonso ahead. What was most astonishing was the gap that McLaren had over the opposition. Felipe Massa scrambled home in his Ferrari, happy to have achieved the best he could have hoped for in the circumstances. Kimi Raikkonen took one miserable, hard-earned point for driving from 16th to eighth. McLaren now has 76 points in the Constructors' Championship. Ferrari is 20 behind. But there was no luck involved in that. Of the rest, there was little to report. Renault was happy to get a fourth place thanks to the efforts of Giancarlo Fisichella. After his strong qualifying performance (due to a light fuel load), he was able to run a solid two-stop strategy, using the soft tyres in both the early stints. No-one was ever really close to him. Heikki Kovalainen spent his time stuck behind David Coulthard, which was the story of his miserable weekend. BMW Sauber decided to split its strategy and with Heidfeld pitting early and Kubica pitting late. Both men were on one-stop races. The latter came out ahead and so finished fifth with Heidfeld behind him. Williams split its strategies as well with Nico Rosberg well-placed for a strong two-stop race. That was dependent on a good first lap and Nico did not really have one. He got alongside Fisichella at the start but was going nowhere but the wall and so had to lift and that dropped him behind a fuel-heavy Heidfeld. That screwed his race and he ended up down the field and out of the points. Alex Wurz used a single-stop strategy and this worked and he was able to bring home a couple of points. The final point went to Raikkonen, who drove a good race from his awful starting position. In part this was reward for that effort. In part it was because others were unlucky or did not do quite as good a job as one might have expected. Scuderia Toro Rosso would, perhaps, have scored its first points if David Coulthard had not run into the back of Tonio Liuzzi at the first corner. A lap later the Italian crashed, either because of a puncture or because of a broken diffuser. One way or another Liuzzi had a right to look glum as he walked back to the pits. He deserved better than that. Tonio's team-mate Scott Speed did a solid job with a single stop strategy and he finished ninth. Honda looked half-sensible for much of the race and the car did look a bit better but smoke and mirrors can only do so much and so Rubens Barrichello and Button duly dropped backwards. Toyota on the other hand got the bad news out of the way early on as both drivers headed to the back as soon as the race was underway and there they stayed, dicing with the small fry. The Red Bulls fell apart, which was expected given a problem all weekend of flexing gearbox casings cracking. Takuma Sato and Anthony Davidson finished close together despite the former stopping twice, the latter only once. This was because Davidson's strategy was ruined by a drive-through penalty for ignoring blue flags. Neither Spyker was running at the finish.